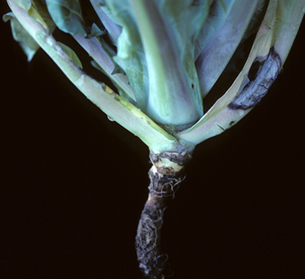 Blackleg caused by Phoma lingam attacks many brassica crops and can spread rapidly within a field. The disease has become less important in cruciferous crops because of successful disease management strategies in seed production. Plants can become infected at the seedling stage or at any stage in the field. Symptoms of the pathogen start as slight lesions on stems at cotyledon scars which elongate, turn brown with a black to purplish border, and become sunken. The lesion extends up and down the stem, the stem becomes girdled and blackened, with many fruiting bodies (pycnidia) embedded in the tissue. Lesions may extend below the soil and attack roots. Phoma lingam can survive for up to four years in seed and three years in infected crop debris. The pathogen infects seedlings, forms pycnidia, and produces abundant amounts of spores which exude from the pycnidia in long coils and are splashed to nearby plants to initiate new infections. The disease is favored by wet, rainy weather. Diseased plants often wilt, lodge, and die. On root crops, symptoms occur in the form of cankers on the fleshy roots and a dry rot may appear in storage. Start with seed certified as disease-free or treat seeds with hot water. Practice a four year rotation in seedbeds and fields. Rogue diseased plants from seedbeds. Improve soil drainage and air circulation. Incorporate crop debris promptly after harvest to hasten decay. Avoid working in the fields when wet. Cauliflower, broccoli, and turnip cultivars are moderately susceptible. Rutabaga, radish, and mustard cultivars are only slightly susceptible.